Selvarasa Pathmanathan alias “KP” who donned the leadership mantle of the Liberation Tigers of Tamil Eelam (LTTE) after the demise of Tiger supremo Veluppillai Prabhakaran is very much in the news these days. Much interest in KP was generated after the story of his relocation to Kilinochchi from Colombo under protective custody was reported by this writer for the “Daily Mirror”. KP’s new residence is located in the Thiruvaiaaru area of Kilinochchi south and is about a kilometre away from the Iranaimadhu junction. The house is situated along the Thondaman by- lane in a compound of around six acres about 100-150 metres to the interior of the Jaffna –Kandy road known as the A -9 highway. Former LTTE political commissar Suppiah Paramu Thamilselvan used to live in these premises and even met his death through aerial bombardment in this compound. Apart from the buzz caused by his relocation to Kilinochchi from Colombo, KP has also been in the spotlight due to his alleged role in the assassination of former Indian Prime minister Rajiv Gandhi. Ever since news reports appeared in the Indian media about him being questioned by India’s Central Bureau of Investigations (CBI) over his alleged involvement in the Rajiv Gandhi killing, “KP” has had several news reports focusing on him in sections of the Sri Lankan media as well as in news organs of various hues abroad. Most of these news reports related to KP being “interrogated” by Indian officials. The 57-year-old native of Myliddy in Jaffna has been the subject of several speculative news reports concerning his position vis-a-vis India. Some opposition politicians in Sri Lanka have also spoken out about “KP.” Government ministers have responded to some of the queries. Several speculative reports have also appeared in sections of the media about KP’s current status and role. Some allege that he is being groomed for greater political participation in the future. Other reports charged him of playing a covert role in operations conducted by the state to combat pro –LTTE activity abroad. Even as these controversies raged on “KP” now based in Kilinochchi continues with his work in the Island’s North. This writer spoke at length about a number of relevant matters with Selvarasa Pathmanathan alias “KP” on the day after the “Deepavali” festival. As is typical of him the ex-LTTE chief was refreshingly open and spoke frankly and freely. The Conversation in Tamil is presented here in question and answer form exclusively for the “Daily Mirror”. Q: Deepavali Greetings! Your last three Deepavali’s were in Colombo under detention. This Deepavali was different.How did you celebrate Deepavali this time? Thank you for the Deepavali wishes. Yes this Deepavali was different as I was comparably free unlike in the past three years. It was very pleasant to be in the North for Deepavali after a very long time. It has been many, many years since I was in the North during Deepavali. I revived a lot of memories. More than being in the North , this year’s Deepavali was a very happy day for me because I spent the entire day at the two children’s homes run by NERDO (North – East Rehabilitation and Development Organization) in the Mullaitheevu district. Q: I am happy to hear that. It was wonderful and very emotional. I am alone here in Sri Lanka while my family is in Thailand. These children are also alone without family care. So we made ourselves happy by becoming one big family. They are like my own children and many of them call me “Appa” (father). I gave all the children new clothes as Deepavali presents. We bathed and wore new clothes. I had lunch with the boys at “Anbu Illam”. We had mutton curry. They wanted to light crackers. So we made arrangements for that. Then I had tea and Deepavali “palaharam” (short –eats) with the girls at “Bharathi Illam”. They had a music, song, dance and drama performance. I then had an early chicken curry dinner with the girls and returned home to Kilinochchi. It was an unforgettable “Deepavali” for me and the children. Q: It is good to know that you were able to bring some cheer and joy to these children on Deepavali and in the process you too gained satisfaction and a sense of fulfillment. I am sure the readers will like to know more about the role of the NERDO and the work you are doing but before that I want to focus on a current issue concerning you. This is about the Rajiv Gandhi assassination, yourself and India seeking your arrest through INTERPOL. Would you like to talk about it now? Of course! I have nothing to hide. You can ask me whatever you want. Q: That’s good. Thanks. Let me ask you directly. What was your role in the Rajiv Gandhi assassination? Were you involved in it? No! A categorical No! !I was not involved in any way in the Rajiv Gandhi assassination!!! Q: Can you elaborate in detail? There was a division of duties in the LTTE then with different departments. One did not get involved with another department. Tamil Nadu activities were under different people. I had no role there and would not be permitted by the leader Prabhakaran to get involved in another department. None of us could do so at that time without orders or permission from the leader. Q: Even though your duties were different you could have got involved if Prabhakaran instructed you to do so. Did he? No. Prabhakaran never ordered me in that way. Like most other LTTE leaders I had no idea at all about this. Even Kittu (Sathasivampillai Krishnakumar) then in London had no idea of this. Prabhakaran asked Kittu to build good relations with India and Rajiv Gandhi. So Kittu arranged for people like poet Kasi Anandan and economist Arjuna Sittampalam to go to India and meet Rajiv Gandhi. While this was going on Prabhakaran and Pottu Amman must have been planning and implementing the assassination. Prabhakaran was well known for his secretive ways and in a matter like this he would definitely have not got many others involved or shared information. So, I was not told anything. Q: You were in charge of weapons acquisition then. Your “overseas purchases” dept was known as “KP dept” then. In view of the importance of that dept would you not have been involved or kept in the loop at least? The involvement of myself or my dept was not necessary for an operation like that. Assassinations come under the purview of the Intelligence division led by Pottan (Pottu Amman). Also my role of ensuring supplies was very crucial for the movement then. Prabhakaran would not have risked any problem being caused to my dept or myself at that time by getting me involved in the matter. Q:What were you doing at the time of the assassination? I was shuttling between India and South East Asian countries at that time. My function then was to find ways and means of procuring and supplying arms and ammunition from abroad to the movement then. Even when in India I used to spend most of my time in Bombay (now Mumbai). I had left India for Malaysia a few days before the incident. Q: Was it because you knew or suspected a major incident like this was going to happen and fled India before it occurred? No, not at all. The date of my departure was planned weeks ahead and totally unconnected to the assassination. Q: But why did India put you on the INTERPOL’s wanted persons list then? The alleged offences were - Life and health, Terrorism and Crimes involving the use of weapons/explosives - Was it not in connection with the Rajiv murder incident? The answer is yes and no. Yes, because it was in connection with the Rajiv incident. No, because it was not due to any involvement by me in the assassination. Q; What do you exactly mean? Can you explain further? The Indian CBI knows I had no hand in the murder. That is why I am not mentioned in the charge sheet in the court case in India over the Rajiv Gandhi assassination. I was not proclaimed as an offender for even alleged conspiracy to kill him. Q: Then why did India issue an INTERPOL notice on you? You said it was in connection with the Rajiv Gandhi incident, Right? Right. The CBI when investigating the murder felt there were some points they needed to clarify with me. This was highlighted during the Jain Commission inquiry into the killing also. But they could not get hold of me as I was outside India moving from place to place. My whereabouts were unknown. That is why they issued an INTERPOL notice. They wanted to question me. Q: On the question of India wanting to question you, here was a news item in the Indian media recently that some Indian officials had indeed questioned you once about the Rajiv Gandhi killing. Has that happened? Yes. It has happened. But it did not happen recently as said by the Indian media. Also it happened twice not once. Q: When did it happen then? When were you questioned by Indian officials? It happened in late 2010 once and early 2011 again. I don’t remember the months off hand. Indian authorities made a request to the Sri Lankan authorities that they wanted to question me over some aspects regarding the Rajiv Gandhi case. Sri Lanka complied with the request as a matter of courtesy. Since I was absolutely innocent in this incident and had nothing to hide I readily obliged. Q: Where did the meetings take place and were Sri Lankan officials also involved? The meetings with Indian officials were held in the Defence Ministry premises in Colombo. Sri Lankan security officials were present on both occasions as observers. They did not participate in the talk but took notes of the meetings. Q: What were the differences in the two meetings? A team of CBI officials met me first in 2010. It was an interview not an interrogation. Later another team of Indian officials met me in 2011. This was more like a discussion. The first one was specifically about the Rajiv murder and the second one a more general discussion on political developments connected to the LTTE. Q: Do you recollect what happened in the first meeting? What did the CBI ask you? The CBI that has been investigating the Rajiv Gandhi killing asked me a few direct questions. First they wanted to know whether I had any prior knowledge on the killing .I truthfully replied I had no knowledge and that when it happened I was not in India. They asked me next whether I had supplied the finances for the operation to which I replied in the negative. I explained that actions like this were usually planned by the LTTE intelligence division which had a secret budget of its own and did not depend on me. Q: What exactly were those questions about? Well about the bomb belt. The girl who blew herself up and killed Rajiv Gandhi was wearing a belt strapped with explosives. They asked me whether I had supplied the belt or the explosives. I replied no. I told them that RDX explosives could be bought in India itself and there was no need for me to buy explosives abroad and supply a little to be used in the belt. I also said that to my knowledge the explosive belt was not bought abroad but manufactured by the LTTE itself locally. They seemed to agree. Q:What about Sivarasan’s gun? By Sivarasan you mean the one-eyed man who allegedly masterminded the assassination and later committed suicide in Bangalore or Bengalooru? Yes. It is that man whom the Indians refer to as “Otraikkann Sivarasan” (one-eyed Sivarasan). Apparently he had a 9 mm pistol in his possession. So the CBI wanted to know whether I had personally supplied the gun to Sivarasan. Obviously I had not. So I told the CBI that I did not. They seemed to accept that. Q: About the second meeting, what happened in that? Maybe, but I don’t know. Anyway it was just a discussion. We spoke about a lot of things like the future of LTTE cadres being rehabilitated, the Diaspora and Diaspora organizations, the effects of the armed struggle, the plight of the Tamil people etc. I aired my views openly. They seemed a little surprised at my honest opinion but seemed to appreciate it. Q: Will there be a third meeting with Indian officials? A discussion or interview with you? I don’t know but if Sri Lanka wants to set up one with Indian officials I am prepared to cooperate with Colombo. I met with Indian officials only because Sri Lanka wanted me to do so and because Lankan officers were present. Otherwise I would not have consented. If India is not satisfied about the previous two meetings and want to question me or talk to me again I am ready but only if Sri Lanka is willing too. Q: From what you told me I get the feeling that you think India was satisfied about the meetings with you. But then why does the INTERPOL notice on you by India still existing? I don’t know. They may be having their own reasons. You will have to ask them that. I can’t answer you. Q: The INTERPOL notice in question refers to you as having the family name of Tharmalingam and the forenames of Shanmugam and Kumaran. Is not your name Selvarasa Pathmanathan? Q: Then why is the INTERPOL notice referring to you as Shanmugam Kumaran Tharmalingam? I don’t know. You have to ask India or INTERPOL It may be because I used to carry some passports with bogus names those days and they may have found one with this name. Q: If an INTERPOL notice was issued by India for you under a wrong name then does it not reflect badly on India and INTERPOL? Q: Sri Lanka also issued an INTERPOL notice on you? What is the position now? I was arrested in Malaysia and deported to Sri Lanka. I am in Sri Lanka now under protective custody. I am sure the INTERPOL is aware of the fact. But if you want to know exactly you must ask INTERPOL or Colombo officials. As for me it really does not matter because I am not wanted anymore globally as I am in Sri Lanka, my own country. That is the reality now and that is enough for me. Q: We were talking about the names under which an INTERPOL warrant has been issued for you. On the question of names there are many who refer to you as Kumaran Pathmanathan and attribute the initials KP as being for that. Others say KP stands for Kannady Pathmanathan. Which is correct? It is true that many people think KP stands for Kumaran Pathmanathan but that is not correct. Actually when I was in the Jaffna University there were about four or five persons with the same name Pathmanathan. So fellow undergrads used to differentiate between us through nicknames. Since I used to wear “Kannadi” (spectacles) I was called “Kannadi Pathmanathan or “Kannadippathar”. Q: There was another person called Kannadippathar in the early days of Tamil militancy. But that was not you? No, no. He was different. I am not that person. The person you are referring to was the first victim of an internal killing in the Tamil militant movement. 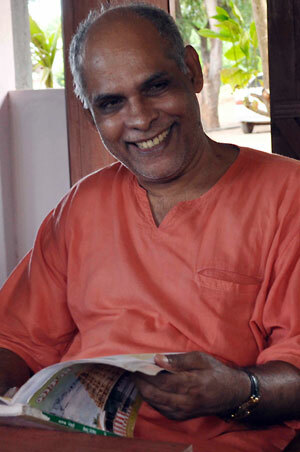 He was one of those who escaped from Anuradhapura jail in the seventies. Sadly his fellow escapees got suspicious and killed him. Q: So go on about KP will you? Are you saying KP is a shortened form of Kannadi Pathmanathan? Yes and you know what? It was Prabhakaran who started calling me KP instead of Kannadi Pathmanathan. The name stuck. Q: I thought Prabhakaran called you “Kazhuthai” (donkey) because like a donkey carrying things on its back you also transported goods? Yes he did, but he would not refer to me by that name directly. It was only when I was not there and that too with some of the senior LTTE members; Never in front of the cadres. With them it was KP always. Q: Anyway Kazhuthai was an affectionate term and not derogatory? Yes he used it very fondly. Q: But did you not use the nom de guerre Kumaran when you were in the TELO(Tamil Eelam Liberation Organization) led by Thangathurai and Kuttimani? Q: But I thought you were originally in the TELO and later joined the LTTE after Thangathurai and Kuttimani got arrested by the Navy in 1981? I know that you also have written like that in some of your articles about me. But that is not correct. My entry into militancy was through Prabhakaran and the LTTE not the TELO. A: I used to be a youth activist in the Tamil United Liberation Front(TULF)My hometown of Myliddy was in the KKS (Kankesanthurai) electorate. After SJV Chelvanayakam it was Amirthalingam who was the MP for KKS . I used to argue with him then saying Tamil Eelam can be achieved only through armed struggle. One day, Amirthalingam introduced Prabhakaran to me and said you all must talk because both of you think alike. Later on another day I had a very long talk with Prabhakaran at the residence of Mavai Senathirajah who is a TNA parliamentarian now. After that discussion I became a helper and later member of the LTTE. Q:Then how did people associate you with TELO? That is because after the LTTE split in 1980 and Umamaheswaran went on to form the PLOTE (Peoples Liberation Organization of Tamil Eelam)those of us who remained in the LTTE under Prabhakaran joined forces with the TELO under Thanganna(Thangathurai). I became quite attached to Thangathurai then and moved very closely with him. This made people think I was in the TELO and joined the LTTE only after Thangathurai was arrested. But I was always with the LTTE. Q: So, how were you known in the LTTE when you joined? A: I was called by my pet name in Myliddy which is Kutti. When I was in India I used the pseudonym Kumaran in some places. But very soon it became KP. Q: From being a senior leader of the LTTE you have evolved into someone involved in community service aimed at uplifting unfortunate people affected by the war. It is in a sense your personal journey towards redemption. This transformation is truly remarkable but there are many who cannot believe that the tiger would change its stripes or the leopard its spots. As you are aware there are many reports about you in the media. Doubts are raised about the activities you are allegedly involved in. You are vilified in the LTTE and pro-LTTE media about your relationship with sections of the Tamil Diaspora. Jaffna newspapers speculate about your entering active politics soon. Then there is also the NERDO a non –governmental organization you set up and administer. There is also your move to Kilinochchi from Colombo which is also looked upon suspiciously by some. Q:What is your response to these viewpoints and accusations? Would you want to reply to those or simply ignore them? I am aware of these views and charges. The media and some opposition politicians engage in them. Most of them are untrue and without valid basis. I am like a football being kicked around by each and everyone. Those who want to criticize the Govt and the Defence secretary find me a convenient instrument. My transformation as you put it is real and sincere. But I understand that many in our society will be unable to accept or even understand such a change in an individual like me. After being involved for decades in promoting violence and destruction I am now repenting and seeking inner peace through service to humanity. I am eternally grateful to the President, this Govt and the Defence Secretary for giving me such a great opportunity. I am truly fortunate and I thank God for this mercy and chance for a new life.But we live in a democracy and it is the duty of the media and opposition politicians to question and criticize. I accept that and am ready to clarify the situation as much as possible. I cannot and don’t want to reply absurd accusations but I am always prepared to respond to responsible questions. I will welcome your questions and will do my best to answer them so that the people of this country get more information about me, my work, my plans, my politics, my projects and other matters of interest. I have nothing to conceal and actually look forward to more and more people assisting the various services undertaken by NERDO. I sincerely hope that this will happen if I can help clear genuine doubts and reveal the true situation.